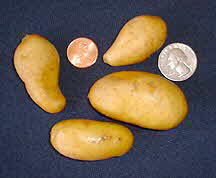 The Princess Laratte potato is similar to the Russian Banana with its yellow skin and flesh. This fingerling has a rich and nutty flavor and has long been a favorite of fine chefs. Wonderfully smooth and creamy when pureed yet maintains a firm texture when cooked.